Common Name: Stephania root, Tetrandra root. Part Used & Method for Pharmaceutical Preparations: The roots are dug in autumn. After the root bark has been removed, the roots are cleaned, dried in the sun and cut into pieces or slices. Meridians: Urinary bladder, kidney and spleen. Functions: 1. To dispel wind and dampness; 2. To stop pain; 3. To relieve edema. 1. Wind-damp obstruction syndrome or damp-heat obstruction syndrome. 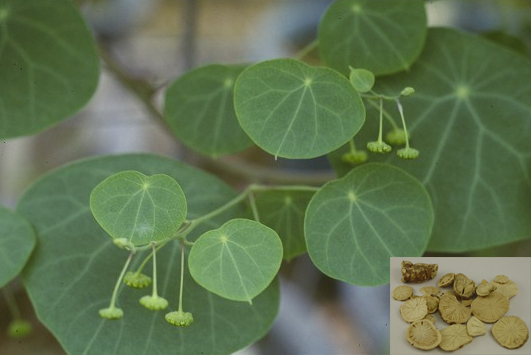 Tetrandra root (Fangji) is used with Talc (Huashi), Coix seed (Yiyiren), Silkworm excrement (Cansha) and Chaenomeles fruit (Mugua). 2. Cold-damp obstruction syndrome. Tetrandra root (Fangji) is used with Cinnamon twigs (Guizhi) and Prepared aconite root (Fuzi). 3. Edema: a) edema with heat signs Tetrandra root (Fangji) is used with Lepidium seed (Tinglizi) and Zanthoxylum (Jiaomu) in the formula Ji Jiao Li Huang Wan; b) edema with signs of weakness of the spleen Tetrandra root (Fangji) is used with White atractylodes (Baizhu), Astragalus root (Huangqi) and in the formula Fangji Huangqi Tang. 1. This herb is contraindicated in cases with deficient yin. 2. Contraindicated in large amounts because it will damage Stomach Qi. Contraindicated in Yin Deficiency, and with symptoms of poor appetite.